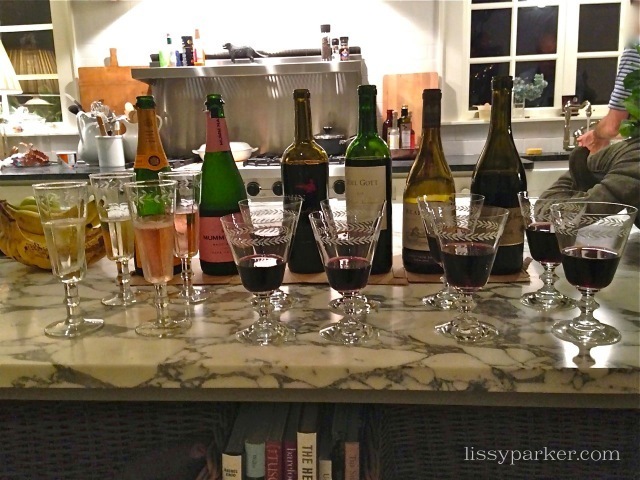 Almost every Saturday night Mr. ‘P’ loves to host a wine tasting. Every guest is enticed with his or her favorite wine—and it doesn’t matter how many guests are there. He encourages everyone to taste test at least a few different wines. High priced or reasonably priced—they are all welcome. Sometimes the bottles are hidden and sometimes they are visible. One of his favorite wines to compare is the infamous ‘Two Buck Chuck’ from Trader Joe’s … $2.50 now. This was the latest display when his family and College son and a friend were visiting. Why not try a wine tasting of your own next Saturday night. A little something for everyone was included … enjoy! I think my Mr H would love your Mr P! Cindy, Mr. ‘P’ is in Italy, Poland and Germany on business. Will be back Saturday and I am sure will have another wine tasting—loads of guest are coming in!